The Presser Foot is proud to be a dealer for cabinets, chairs and storage furniture from Koala and Horn. Whatever cabinet you choose, you can be sure you will get only the best quality and functionality from both of these manufacturers, with a variety of options and styles that will fit your needs. You can see many Koala Studio cabinets in different finishes today at both our Longmont and our Fort Collins locations. Koala Studio cabinets are hand-built by American craftsmen, using the finest materials in their high-tech West Chicago factory. A Lifetime Limited Warranty for each cabinet ensures you years of enjoying the finest sewing furniture available. 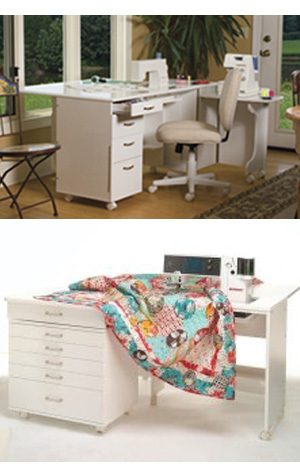 Koala Studio cabinets are engineered to hold today's largest domestic sewing, quilting and embroidery machines. Electric lifts effortlessly lower or raise machines weighing as much as 85 lbs., stopping at any position with the touch of a button or remote control. Machines are solidly held in place, eliminating all machine vibration while operating at speeds over 1,200 stitches per minute. Custom machine inserts are available in wood or acrylic for any sewing machine or overlock machine, and the Studio top surface allows you to use the surface of the cabinet as one continuous, flat surface for embroidery or even cutting table applications. Each Koala Studio cabinet starts out as a base model and is specifically customized for you. Choose from eight elegant finishes with wood grain ticking and rich color. Every inch of your cabinet, including the rounded corners and beveled edges, is finished with Koala's exclusive scratch-resistant and water-resistant veneer. When you order your cabinet you can customize the height depending on your projects and your own height. An adjustable foot control rest and platform is available. Endless combinations of accessories give you complete flexibility so that you can choose exactly the right cabinet for your needs. Shelving units can be added to the doors and onto the back of some models of cabinets to provide storage for thread boxes, fabric and more. Notion and fabric palettes on the top of each door allow you an extra surface to place a small cutting mat, or a home for pins, small tools and even your favorite beverage. Koala Studio cabinets are built with steel components, including a 270º heavy gauge door and weight bearing barrel hinges. Locking casters with non-marking polyurethane tires and metal cam locks for shelves and palettes are standard. Drawers feature silent soft-closing hydraulic cushions and are weight tested to hold 120 lbs. Delivery of your Koala Studio cabinet to your home is included. During a scheduled window of time, your cabinet will arrive fully-assembled and will be placed in the room of your choice by experienced delivery men. All you need to do is position the optional shelves, add your machine and enjoy your new studio. To build your own Koala Studio, visit www.koalacabinets.com and use the online room planner to create multiple layouts and see what will work the best for your space. Bring your plan into The Presser Foot for personal assistance and we will order your cabinet for you! Made in the USA by Horn of America, Horn cabinets are a standard of the sewing cabinet industry. Horn of America owns the factory, which gives them control over the materials, construction process, and the packing and shipping process. Only the best raw materials are used for construction. Horn cabinets have a lifetime warranty and feature heavy-duty construction and hardware. Their melamine, mark-resistant surfaces are easy to clean and long-lasting. Locking casters make them easy to move around and re-position, a great feature for rooms that serve more than one purpose. Most Horn cabinet models feature heavy-duty airlift platforms that allow your sewing machine's bed to sit flush with the top of the cabinet, giving you a large sewing or quilting surface. Inserts are custom cut, so they can be ordered for any make or model of sewing machine. With different finishes to choose from, you can find one to match your decor. Side cabinets with multiple drawers are also available to add more storage options to your sewing or quilting table. Horn cabinets come almost completely assembled, making it easy for you to set up and get right to work instead of spending your time putting furniture together. For most models, all that is required is for you to pick up the cabinet from our stores (or choose white glove delivery through Horn for an additional fee), put on the casters and drawer handles or pulls, and you're ready to go! We have some models of Horn cabinets on display at both of our locations. With several models and configurations for sewing, quilting and crafting, you can find a Horn cabinet that will fit your requirements.